Are you ready for the answer? What decorating DIY could possibly be cheaper than painting?? It's been a long winter (it always is) and it's easy to get stir crazy and want to make some major changes in your home. Especially if you've been living in your home for awhile you may be ready for a drastic change. All you need to get started is a few ideas and some furniture sliders, then viola! Instant makeover. During the process you may find that you don't need some furniture anymore, or may want to borrow other pieces from another room. Try things you've never done before - have you tried your sofa on a different wall? Layered in front of the picture window? Across from the window? Perpendicular? You get the idea! Even if you're not ready to rearrange, it's important to keep this in mind when you are purchasing new furniture because you want the most versatile pieces that allow for several room configurations. The best combination for this is a sofa and 2 upholstered chairs. The configurations are so versatile in any space with this combination. So what do you think? Are you going to rearrange your room today? As I was drafting my monthly email newsletter I searched for a green room to share for some St. Patrick's Day love. It was hard to decide which one though - some were soft and subtle, others were vibrant and geometric, and others still were neutral with just a few pops of green. Since it was so hard to pick just one here I will share all the "green rooms" that grabbed my interest! If you had to pick just one, which would be your favorite? Well, this morning Pantone announced their color(s) of the year for 2016 and all I can keep thinking is that they seem to have suffered from decision paralysis and couldn't pick just one! It is an unprecedented move by the industry's color authority so we'll see how it plays out. I understand what they are saying about the colors working together to provide balance, harmony etc. but it's a tough line to walk as a single recommendation. So for this post I am going to totally ignore the "serenity" blue aspect of the color and instead focus on the "Rose Quartz" which is a pretty blush pink. THAT color I have been seeing more of and I would like to take a look at it in different aspects of interior decorating as a subtle trend. So as the name references this is what natural Rose Quartz looks like. It's a beautiful soft pink that reminds me a bit of Himalayan rock salt. The history and meaning of the stone itself is related to the heart and "unconditional love." Rose Quartz is a pink coloured crystal believed to have heart-healing properties. It encourages healthy self-love, and can bestow compassion, forgiveness and acceptance. Rose Quartz is also soothing, calming and reduces stress and tension. I attended a Sherwin Williams color forecast earlier this fall and also saw lots of blush colors as part of their forecast. I'm going to say that the closest of these is the "charming pink" on right since it has a similar clarity of color that the stone shares. 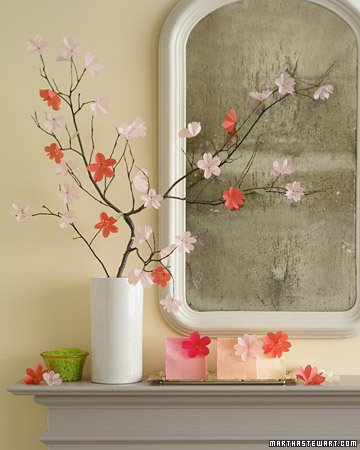 But the muted blush pinks work really beautifully with subtle grays to warm up the color palette. Yes... even METAL is going pink! 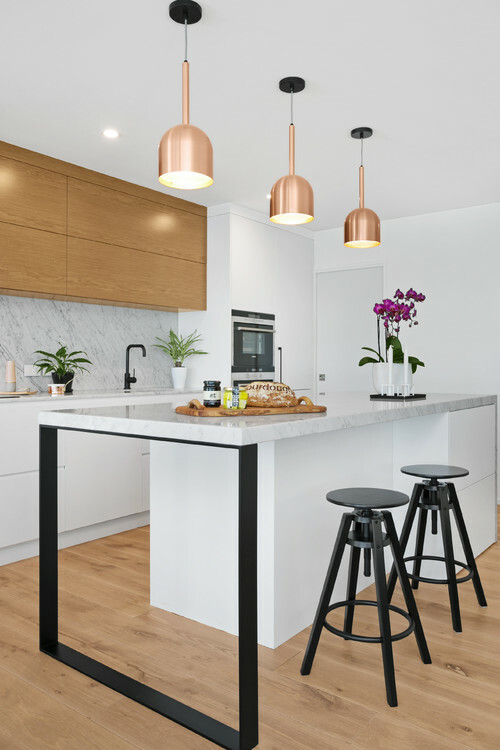 Now I'm not suggesting that everyone replace their faucets and light fixtures with rose gold but in the right application it's a nice option and welcome change to the standard "silver" or "chrome" options. First brass was making a comeback in the warm metal options, and now rose gold is here! 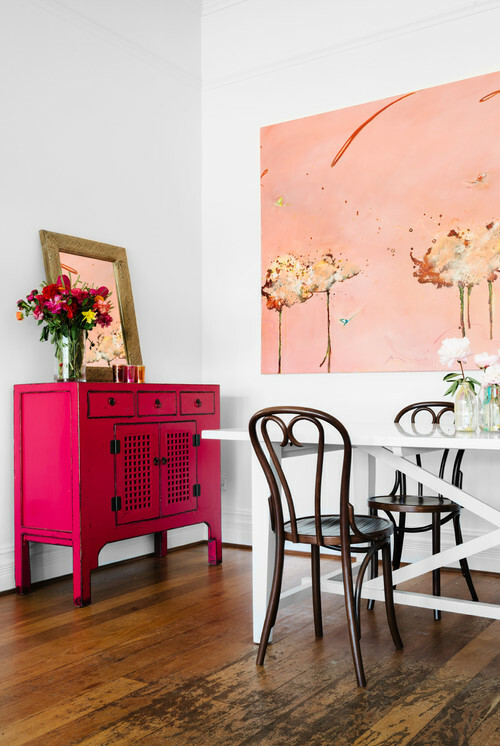 A nice pink accent piece would be a fun addition to a room! Either paired with high contrast dark colors or keeping light and airy with other light neutrals. So after seeing a few examples of the Rose Quartz / blush pink in context what do you think? What do you think of Pantone's announcement in general? Would love to know, leave a comment below! I invite you to sign up for my free monthly email newsletter by clicking here! Every week when I think about a potential blog post there are so many ideas that come to mind sometimes it's hard to choose. One of those recurring thoughts is to share a very valuable "life resource" with you. I follow many blogs & podcasts and a few months ago through the "Beyond the To Do List" podcast I learned about a little book called "Getting Things Done" by David Allen. Actually, I kept hearing the reference "GTD" and the "GTD system" that finally I just HAD to look it up. This book isan extremely valuable resource not just for getting things done, but for streamlining your work process and get things off your mind. I figured getting back to work after having our first baby would be the perfect time for me to learn more about it. So I went to the library and devoured it within a few weeks. (I only had to renew it once - c'mon I had a 4 month old at the time!) I kept laughing at the irony of me reading about "getting things done" instead of actually just getting things done... but I knew this would transform my habits and so I wanted to learn about it before getting back into the swing of things. The tips & methods he details for processing information have been insanely helpful. One of the things I often felt when things got busy was that there were so many "moving parts" it was hard to keep track of the loose ends. His tips for "closing the loops" in our minds have been so valuable I've really felt inspired to adopt this system for both my design projects and my personal life. So now I feel that I should return the favor and tell everyone about it! How did I not know about this sooner?!? So here is a link to the book and website, and below are a few of my favorite parts of the GTD system. I love his tips for creating @Action, @WaitingFor, Read/Review and Reference folders. They really help keep things organized and make sure I am not forgetting anything. I am still working towards an empty inbox but I've enjoyed processing my emails with his tips. And since I use Gmail for work, it's easy for me to tag emails directly from my sent mail so I don't forget to follow up with people I've contacted! Splitting up a task or job by actionable items might sound like a no brainer, or maybe even a waste of time for those smaller tasks, but his idea of breaking things up by Action (emails, calls, errands, agendas, etc) has been a really helpful way for me to manage my to-do's. I'm still slowly adapting to this because I used to always organize my lists by job and it feels weird to separate them. But ultimately I do agree this makes a lot of sense and will be beneficial to view all my to-do's holistically. Have you already heard about GTD? Have you been using the system, or like me wish you had discovered it sooner? I'd love to hear your thoughts! I hope you found this post helpful. Well hello there! I have returned from maternity leave and it's so good to be back! I started back gradually over the summer and now that it's September I am back up to speed again. This is the first post on my blog since returning and I am excited to keep up with my social media again. What I really like about these is that they not only show window treatments but also pillows and throws. The furniture remains exactly the same but it shows how powerful color & accessories are in transforming a room. i would love to show you a few of my favorites and what I like about each one. So let's get on with it shall we? 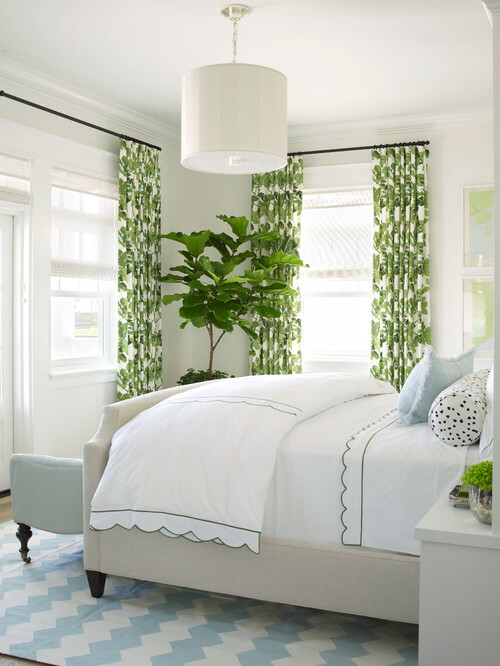 You can see how the blue livens up this simple bedroom and the mix of solids and pattern also adds interest. They added a table lamp next to the bed. All of this is very simple but adds so much sensory experience to the room. This large window and sliding door combination looks great with a dual layer window treatment. 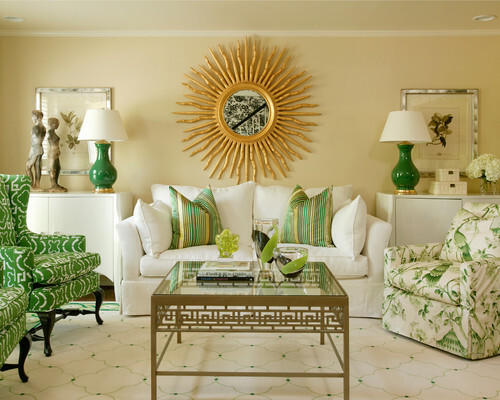 In addition they've replaced some of the green accessories with a simple white orchid and throw pillow. Same furniture but wow - look at the difference! Another dual layer window treatment - blinds with patterned panels on each side. The addition of sunflowers in a vase and throw pillows really pull the room together. Please also note that the curtain rod is hung as high as possible and the curtains are brushing the floor. Full length curtains really keep the windows looking tall! Talk about framing a view! The curtains really draw attention to the windows, and the throw pillows and blanket repeat the colors and introduce new pattern. 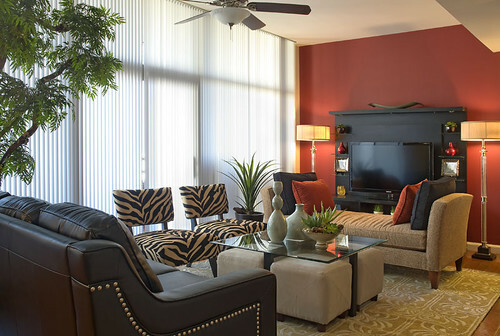 This is also a great example of how a neutral couch and wall color isn't a recipe for boring! Accessories are an easy way to upgrade and change a space. Again here is a simple upgrade with a valance, and the color is repeated in the flowers and bowl of fruit. Also note how this curtain makes the window seem taller? If you look at the original window and notice how low it is, then notice that the top of the valance is lined up with the top of the cabinets. Viola! Tall window magic. Bay windows can be tricky, and while I'd say about 90% of the time in general it's best to let as much light in as possible. But sometimes it's good to break that rule and go for cozy drama and have fun! Curtains carve out space in an otherwise large room, especially if there is a lot of other natural light available. This looks fabulous, plus all the accessories on the table really pull it all together. Even in really contemporary loft spaces (maybe especially in these spaces) curtains can really add a soft touch without taking away from the space. The sheer curtains shown below emphasize the height of the room, let light filter in, and soften the hard edges in this space. So what do you think of these transformations? 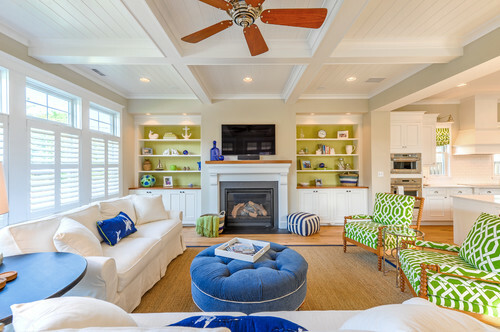 Do you see the potential for a color & accessory makeover in your home?? This is the fun part that really adds a lot of personality to a home, is easy to update, and makes a room feel complete. Thanks for reading! As I mentioned earlier all Before & Afters are compliments of Smith & Noble! You can take a look at all of the transformations and play with the slider from the link below. Now that you've read how to purge & declutter, and how to smartly reduce what you bring home, I would like to share a few design tips on creating a beautiful space using what you already have. This is the most important step, and the first I do when I meet with a new client. Brainstorming all our ideas and coming up with an organized master plan for the room will keep your goals on track. It's important to understand how you currently use the room, and how you want to use it going forward.This information will guide any decisions you make going forward. Sometimes it's hard to see new potential for the same old pieces in the same old room. That's one of the biggest benefits a decorator can bring to your job is a fresh new perspective! 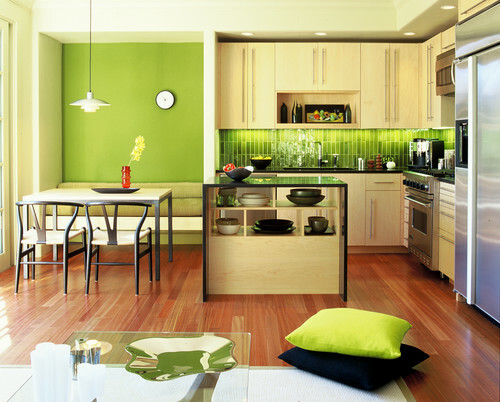 To start getting some ideas you can look on Pinterest or Houzz for other rooms that inspire you. 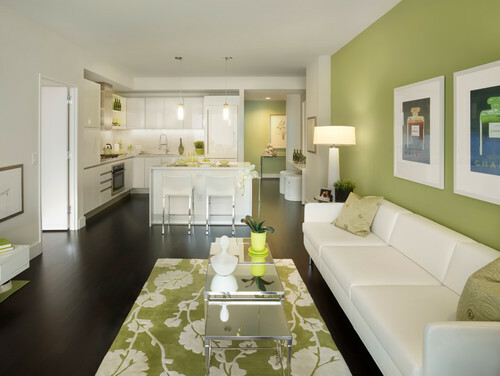 Then look for a common theme in them, are you drawn to neutral colored rooms? Bold colored accents? Mid century style? After the purge, some inspiration, and a plan you will start to see your things in an all new way. Try new things with your existing pieces. 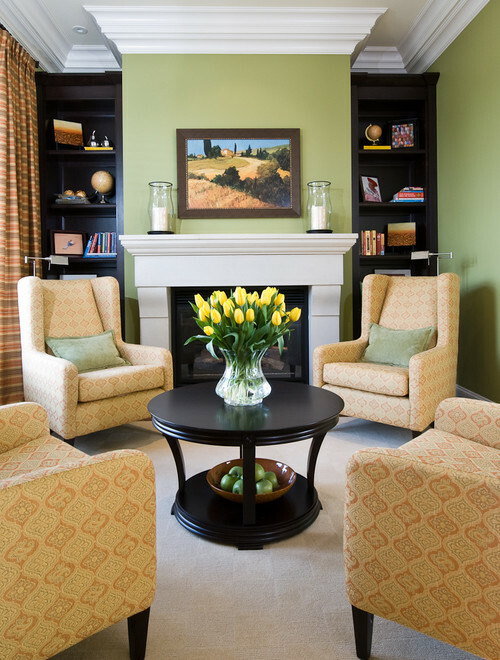 It could be as simple as rearranging the furniture to create a better seating area. Or maybe you found an easy DIY idea that will help you repurpose that old side table, chair, or accessory. Once you're set up the foundation for the room using what you already had, you'll have a better sense of what you need. Check back with your plan to see what your other goals were. How many were accomplished with what you already had? And how many need to be filled in with new purchases? If you head out shopping bring your design plan with you to keep you on track. If you have a lot of accessories you want to keep but they aren't working together, I would recommend rotating them seasonally. 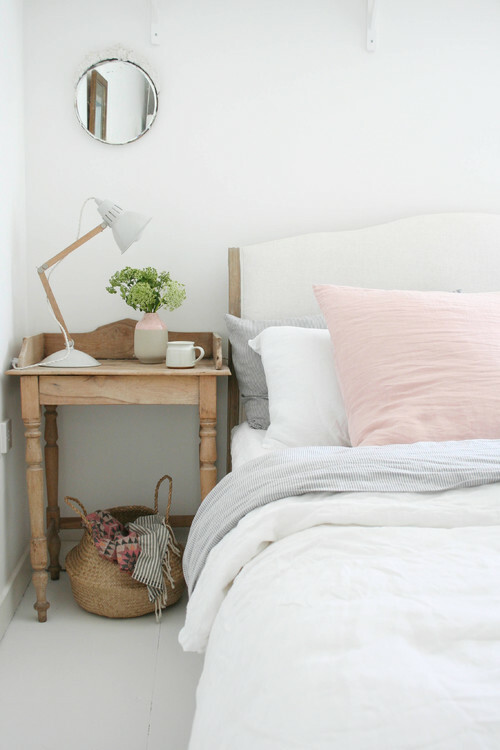 Keep out lightweight linens and fresh bright colors for the spring, and store your heavy blankets, curtains, pillows, carpet, and darker colored accessories for the winter. Show yourself and your new space some gratitude. It may not be magazine perfect, but nothing really is. Enjoy the change you've made in your home, the new freedom from clutter, and the well planned decor you have in your home. Maybe you can even celebrate by hosting a party to show it off! I hope this mini series has helped inspire you to redecorate a room in you home. Last week I shared a few tips on how to declutter your home by purging things you don't need or love. (click here for article). This week I will share some of my tips on how to avoid accumulating too much in the first place. Step 2: avoid buying too much stuff! Now this is tricky because shopping feeds into our desire for instant gratification. We are constantly overwhelmed with lifestyle ads & coupons that say "buy this and you will be happier." But the truth is that happiness may be short lived - then you're just left with "stuff". So here are my tips & strategies to help resist the temptation. Yes, you can do it. Someone is always curating an enticing list of "must haves", and you surely can find some exciting deals on there. But the devil in these sites is that there is only a limited quantity and it's gone. It bullies you to buy now or forever hold your peace. So my advice is if you're not actively looking for something - don't open that email! Or better yet - unsubscribe from such emails and only log in when you are looking for something. Seriously - you will thank me! Impulse shopping is also the devil so I suggest making a list and sticking with it. At the beginning of every room redesign I work on we create goals for the room, and then define what it we need to fulfill those goals. I write up a design plan with all the details and items to buy for each client. Then I suggest to put the list on your phone, tablet, or in a program like Evernote that syncs with everything. Or just keep the design plan in your wallet. This will keep you on task when you're shopping around and resist unnecessary purchases. If you have a few items you want or need, create a list then sleep on it. This gives yourself time to sort through your decision and prioritize your purchases. Keeping an ongoing list of "wishes" will help you stay organized and avoid spending extra money on things you don't need. Plus it gives you the chance to change your mind without spending too much time or money. Contemporary Bedroom by Black Mountain Design-Build Firms Living Stone Construction, Inc. So now you're in the store and you can't resist an item. It grabs your attention and you want it! Go ahead and put it in your basket. Walk the rest of the store with it and re-evaluate the object at the end of loop through the store. Does it meet the criteria you established for your goals? (color, category, texture, etc) If it's not perfect then put it back. Usually a walk through the store will help you sort through other options and may provide the right perspective. Another strategy to postpone a purchase is to photograph it (in person) or Pin it (if online). This way you won't loose track of it and can go back to make the purchase later. If you collect enough images then you can even create a moodboard and see how all the items will look together. This will make sure you're staying on track with your goals. Many people find shopping a pleasurable experience, but perhaps it provides too much temptation to make an unnecessary purchase. In this case when you feel the urge to shop, make a list of what you want to get it off your mind, then find something else entirely different to do. Think of other hobbies that you enjoy such as reading, watching a movie, going out to eat with friends, working out, etc. There are plenty of other hobbies to distract yourself from the urge to buy! I hope these tips & strategies provide you with some ways to manage your purchases. What ways do you find helpful to reduce accidental shopping, and to ensure you make the right purchases for your home? 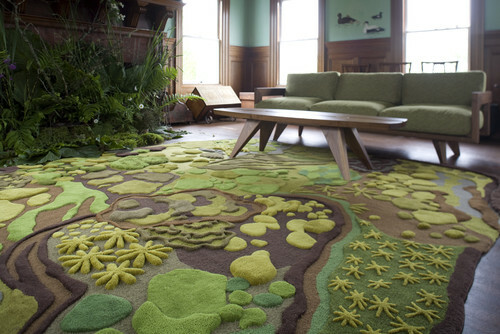 "Have nothing in your home that you do not know to be useful, or believe to be beautiful." Ahh... doesn't that sound so simple? When we think about our homes it's easy to get caught up in our consumer culture, or the latest trend and before we know it we have accumulated a mass quantity of things we don't use, or don't even like that much but hold onto anyway. Since spring officially starts tomorrow now is a great time for a little spring cleaning & a good declutter. The ultimate goal is to pull a room together and make a few really special pieces stand out. In order to do that we need to reduce the excess clutter and simplify the surroundings! Here are a few tricks I find helpful to make the purge, and strategies to stay on top of it. Define what it is that you like, don't like, or don't use. What are your goals for the room - Do you need a cohesive color scheme? Large scale artwork to offset smaller items? Updated furniture? Then decide what you have that doesn't work towards your main goal and put it aside. Start with one room at a time to avoid being overwhelmed. Pare things down to what you need and like (useful or beautiful) and see if you can repurpose an item in another room. Eventually work your way through the entire house until you have a clean slate. Ideally you'll look to purge all the time. Whenever you look at something and think it should be replaced, updated, don't like it anymore etc - put it aside. Our tastes change and evolve every few years, so it's good to keep updating frequently so our home evolve with our tastes, instead of putting things off until it feels overwhelming. Doing it often and in small doses won't feel so emotionally & physically draining either. Consider purging with each change of the season - did you use all winter decor this past season or can you purge some of it? Pick a method below or try a combo to see what works best for you. A big part of purging is how you feel about the stuff you're getting rid of. If you can rationalize letting things go you'll be much better at staying on top of purging! Designate a basket or box in a small corner of your home. As soon as you grab something from your closet that doesn't fit well, or you just don't love anymore put it in there!! Same with any serving dishes in your kitchen, decorations, surplus office supplies, technology, toys, etc. The goal of this is to "temporarily" get rid of it. For many this is a much easier decision to make because it's not final. If you need to just "grab that shirt" in a pinch you can since it's still in your house. But most likely you will gradually keep adding to that donation box and then forget what you've even put in there. Then in a few months it's one step closer to the door and it's time to make a donation! 2- Donate while it's still good! Nobody gets excited about buying anything second hand that is damaged. The trick to making a great donation is to get rid of things BEFORE they are destroyed. As you start loosing interest in an item don't feel bad about getting rid of it - someone else will appreciate it that much more! So you spent quite a bit on that side chair and kind of regret it? Try selling it on your own through a resource like Craigslist or Ebay. Or try finding a consignment store in the area to help you do it and share a bit of profit. This is a win-win because people love to buy nice items for a fraction of the price and the seller gets to recoup some of the cost! When I sell an item on Craigslist for example I try to research what a "new" similar item would sell for, then offer mine for about half price. Take a photo of your beloved object so you can always remember it. Most times it's just the memory of who gifted the item, rather than the actual item itself that brings you joy. So snap that photo of how you used it in your home, archive it on your computer, then share with joy with someone else! I hope you found this post to be helpful! This is Part 1 of 3 so check back soon for more tips on keeping your objects from owning you! Also if you're interested in some local resources drop me a line - I'd be happy to share what I found helpful in the area!